BendPak Lifts – 4 Post Parking Lift – PL-14000– 14,000 lb. Lifting Capacity - Gary Bloom Sales, Inc. 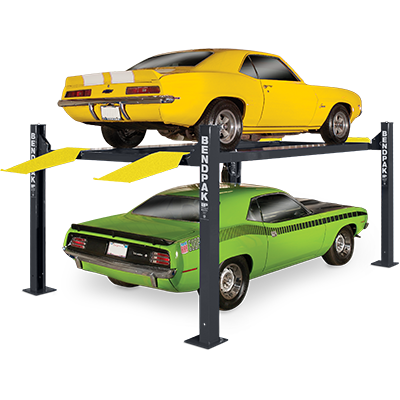 The PL-14000 by BendPak is a four-post parking lift designed for both indoor and outdoor lifting and parking operations. It’s engineered to be the most cost-effective way to triple the capacity of a typical parking area. Shared, ganged columns increase value by reducing the number of components required for multi-unit installations. 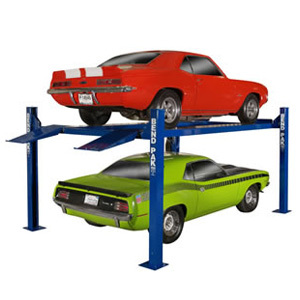 Each triple stacker parking lift uses a specially designed base frame that distributes the load, making these unique lifting systems suitable for installation on virtually any residential or commercial concrete floor. 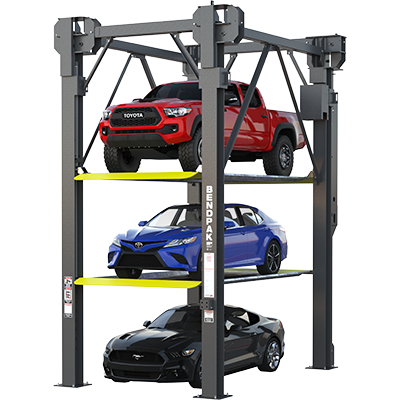 The PL-14000 parking lift by BendPak can accommodate both cars and SUVs and may be configured as a stand-alone parking lift or combined into rows of multiple units. Each deck supports up to 7,000 lbs. When installed in rows of multiple units, the lifts share columns, dramatically increasing space efficiency. The rugged frame utilizes a dependable hydraulic and cable-based lifting system for ultimate efficiency and safe operation. 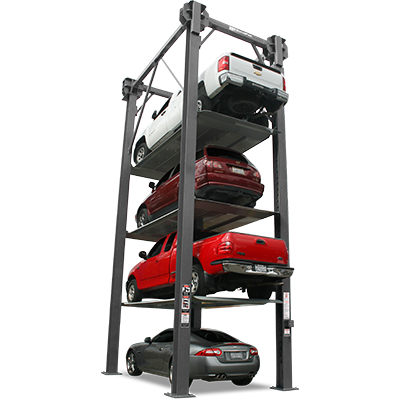 Each stacking parking lift system incorporates many distinctive features, such as a full-width platform to keep bottom vehicles protected, a single hydraulic lifting cylinder combined with heavy-duty steel lifting cable, automatic safety locks and reliable and an ergonomic hydraulic power unit. Leak-proof cylinder technology is only available for BendPak four-post lifts. If you have a ceiling high enough for a triple-stacker, BendPak offers models with overall heights of 211″ / 235″ / 281″, and these lifts are fully customizable. 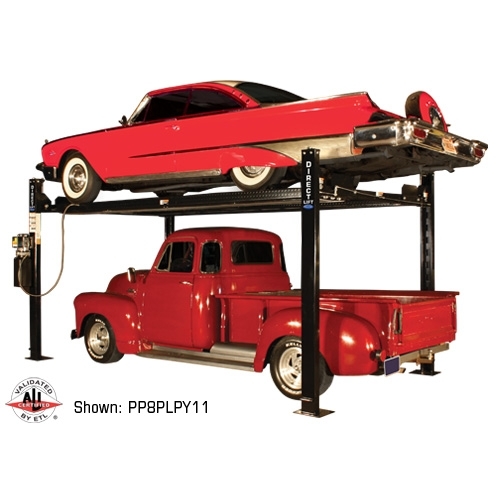 The PL-14000XL, for instance, comes with an extended frame, so limousines and other extended-length vehicles can be lifted with ease. Each model features a set of unique closeout legs that are available for purchase. These sets are sold separately.